Dr. Vincent Onywera (Visiting Scholar from Kenya in 2009), Dr. Kristi Adamo, Dr. Mark Tremblay and their colleagues have co-written a paper, “Adiposity and physical activity among children in countries at different stages of the physical activity transition: Canada, Mexico and Kenya,” that was recently published in the African Journal for Physical, Health Education, Recreation and Dance. Citation details are below as well as the abstract, which provides a summary of the study. VO Onywera, M Heroux, E Jauregui Ulloa, KB Adamo, J Lopez Taylor, I Janssen, MS Tremblay (2013). 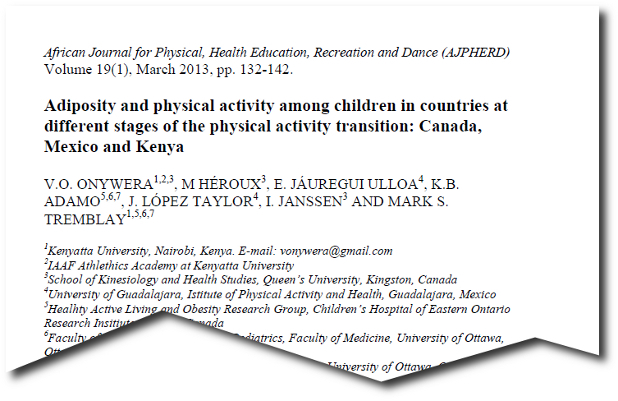 Adiposity and physical activity among children in countries at different stages of the physical activity transition: Canada, Mexico and Kenya. African Journal for Physical, Health Education, Recreation and Dance (AJPHERD);19(1):132-142. ABSTRACT: Physical inactivity is a risk factor for childhood overweight and obesity, and is associated with habitual lifestyle behaviours that are in rapid transition in many countries. Data comparing the weight status and physical activity among children in countries at different stages of the physical activity transition are lacking. The objective of this study was to compare the weight status and physical activity levels among children in Canada, Mexico and Kenya as a model to assess the physical activity transition. School children (aged 9-13 years) from Canada (n=736), Mexico (n=193) and Kenya (n=179) participated in this study. Body mass index (BMI) was used to determine weight status (underweight, normal weight, overweight and obesity). Activity monitors were used to measure daily step counts. Findings showed that 25.6% of Canadian children were overweight or obese, compared to 35.7% and 5.6% of Mexican and Kenyan children, respectively. Results indicated that 41.2% of the Kenyan children were underweight compared to 10.9% and 6.4% of Mexican and Canadian children, respectively. Mexican and Kenyan children were more physically active than Canadian children, accumulating an average of 15,757±5565, 15,605±5963 and 10,730±3969 steps per day, respectively. This inter-country comparison shows that childhood overweight and obesity levels are lowest and physical activity levels are high in Kenya, a country at an early stage of the physical activity transition. Further research using more representative samples is recommended.